It just happened again. You know when you pick up a new cookbook, start looking through it, and quickly realize you want to try everything you see? I do mean everything. Every page of A Modern Way to Cook: 150+ Vegetarian Recipes for Quick, Flavor-Packed Meals has something I want to try. This is the new book from Anna Jones, and I recently received a review copy. The recipes all offer fresh, pretty combinations that are plant-focused for eating well. The colors alone in the Bloody Mary Salad with Black Rice made with heirloom tomatoes, celery, and olives, drew me to it. And, the Avocado Fritters with a polenta crust just sound like a delicious idea. The convenient thing about this book is that the recipes are organized by how long they take to prepare. If you’re short on time, stick to the first couple of chapters, and when you’re planning a more elaborate meal look to the Forty-Minute Feasts. There’s also a chapter called Investment Cooking for things to make in advance like nut butters, homemade chickpea tofu, vegetable stock, dips, and more. Last, there are also breakfast recipes and desserts. I plan to try the Salted Almond Butter Chocolate Bars soon. 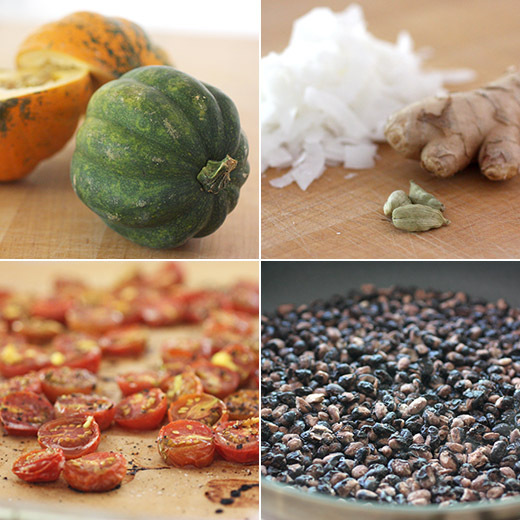 I had two reasons to try the Squash, Roasted Tomato, and Popped Black Beans first. One reason was that I just received a couple of little acorn squash from my CSA, and they were perfect for this salad. And, the second reason was: popped black beans. I thought, what are popped black beans? I love all things popped. I’m a complete popcorn addict, I was delighted to try popped sorghum for the first time and have made it several times since, and I’ve experimented with popped amaranth with less success. But, popped black beans was new to me. A quick online search informed me that this is something that Jamie Oliver has included in a couple of recipes in the past, and I managed to never hear of it. I couldn’t wait to give it a go. To begin the recipe, the squash was sliced, tossed with olive oil and salt and pepper, topped with ground seeds from a cardamom pod, and roasted until tender. Meanwhile, cherry tomatoes were halved, tossed with olive and salt and pepper, and topped with grated fresh ginger. The tomatoes were roasted for the last 20 minutes or so of the squash cooking time. Just before the squash was finished roasting, the pan was removed from the oven and flaked coconut was sprinkled on top. The pan went back into the oven until the coconut was toasted. The dressing for the salad was a simple mix of yogurt, lime zest, lime juice, and ground cardamom with salt and pepper. And, at last, it was time to try popping black beans. Black beans from one can were rinsed and drained, and the beans were left to dry on paper towels. A skillet was heated over medium heat, and the dried beans were added. The beans were dry fried until the skins popped and became crisp which takes about five minutes. I sprinkled on a little salt as they crisped. The salad was served on a platter with the squash, coconut, and tomatoes scattered about. The beans were added on top, and the dressing was drizzled over everything. Now, first, I have to say that the “popped” black beans were tasty, and they’d make a great snack. The edges do become crispy, and that’s always a welcome texture. But, I’m not sure I agree with the name “popped.” The beans don’t transform the way a popcorn or sorghum kernel does. They just become dry and the skins crack. 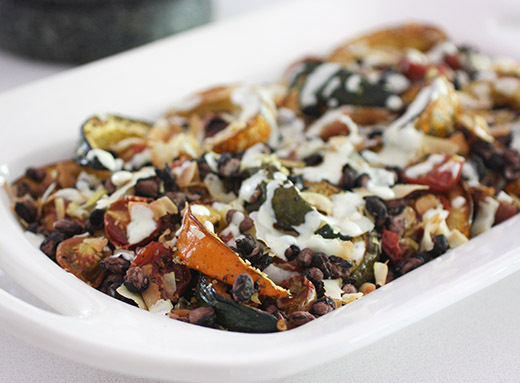 They do, however, work very well as one of the many varied elements of this flavorful salad. There was so much texture from the vegetables and the toasted coconut, and the flavors of cardamom, ginger, and lime combined nicely. Now, I have several more recipes to try from this book. A beautiful and mouthwatering end of summer salad! What a tasty combo. This is my kind of vegetarian meal. Love those popped beans. i was so intrigued by your instagram of the popped black beans, and i'm thrilled with what you did with them! i would love this! I know that I would love this book Lisa, each component of this salad sounds amazing. Great review! "What are popped black beans", that was my first thought as well. Thanks for your thoughts and explanation. The book sounds like a good one and I like the way you said it was organized by the time needed to prepare the dishes. I am a cookbook freak (laugh). 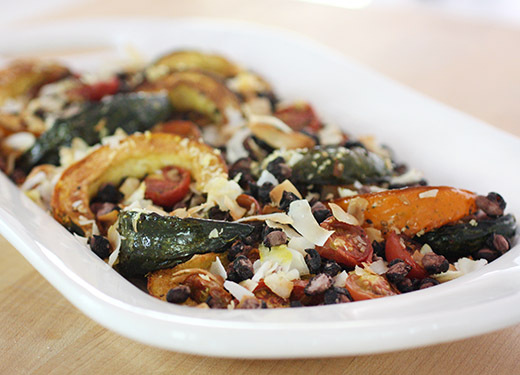 This is a wonderful vegetarian dish and with cooler weather, this would be ideal. Thanks for sharing. Neat dish! Whatever you call the beans (popped or not), they sound pretty tasty. Thanks for this. The chapter titles alone are intriguing, Lisa. The salad you tried is perfect for fall and the idea of "popping" the skins of black beans is fun and I bet tastes divine.